My minor league team and stadium review took a detour this week as I went to Nationals Park in Washington, DC to see the Tampa Bay Rays take on the Washington Nationals. The Rays and Nats had a home and home 4 game series this week, splitting two games in St. Petersburg before moving to DC for a game set. 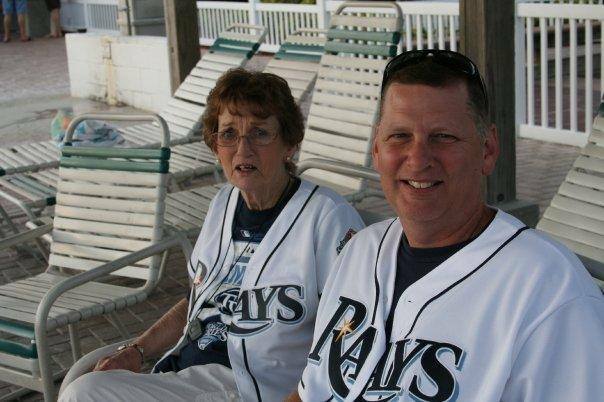 While I have lived in the DC area since 1987 and have been a Nats fan since they moved from Montreal, my heart lies with the Rays because of my ties back to St. Petersburg. 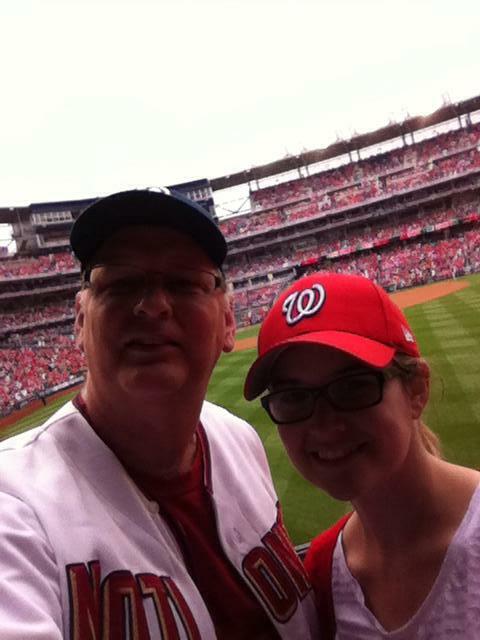 I have developed pretty deep ties to the Nats. My daughter attended the first Nats game at RFK Stadium on April 15, 2005; we were in attendance at the Nats final game in RFK on September 23, 2007; and I was in attendance to see the Nats win their home opener at Nationals Park on March 30, 2008, won with a Ryan Zimmerman walk off home run home run. It was only the third time in MLB history that third walk-off home run in major-league history was hit in the opening game of a new stadium. So for this season, I pull for the Nationals in 158 of 162 games. The other 4? When they are playing the Tampa Bay Rays. My night started in row 4 behind the Rays dugout. It was a good mix of Rays and Nats fans behind the Rays dugout. One section over and a couple of row up was the Rays owner, Stuart Sternberg. I have to admit, I saw a pre season interview with Stu and wasn’t impressed, but during the game, he seemed very friendly and talked with Rays fans who were in attendance. I just want to know, who does he know to get front row seats?? In the 7th inning, a group of 4 left for the evening and I decided to slide down a few rows to get an even better view by moving to the first row behind the dugout. With the rain now coming down at a steady rate, and with one man on, Steven Souza, Jr. (a former Nat who in the last game of the 2014 season saved a no hitter for Jordan Simmermann for the Nats) decided to bunt, Given the conditions, it was the right call. Zimmermann fielded the bunt, but threw over the head of Espinosa at first. 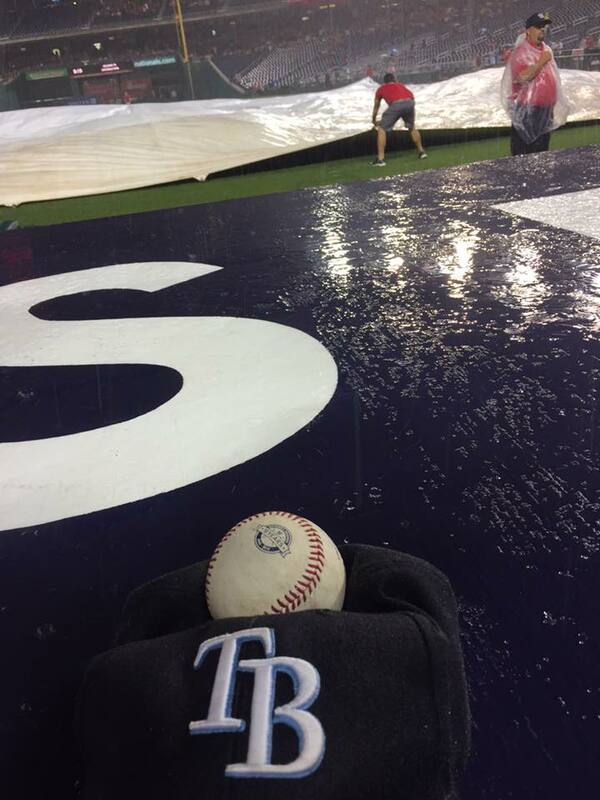 As the runners rounded the bases, Bryce Harper threw wide of home and into the Rays dugout, so Souza was given home. Basically a little league home run!! Little did I know that being in the front row, I was captured on Sun Sports tv applauding the runs! My mom would have been proud!! In the video below I appear at about 34 seconds in of the play. The game was delayed by about 40 minutes. A few us die hard fans stood there in the rain with nothing but our jerseys and hats. Some in attendance struggled with ponchos. This is why real men watch baseball with just their jerseys and hats! The final score was 5-0 Rays, after being shellacked by the Nats 16-4 the night before in St. Petersburg. 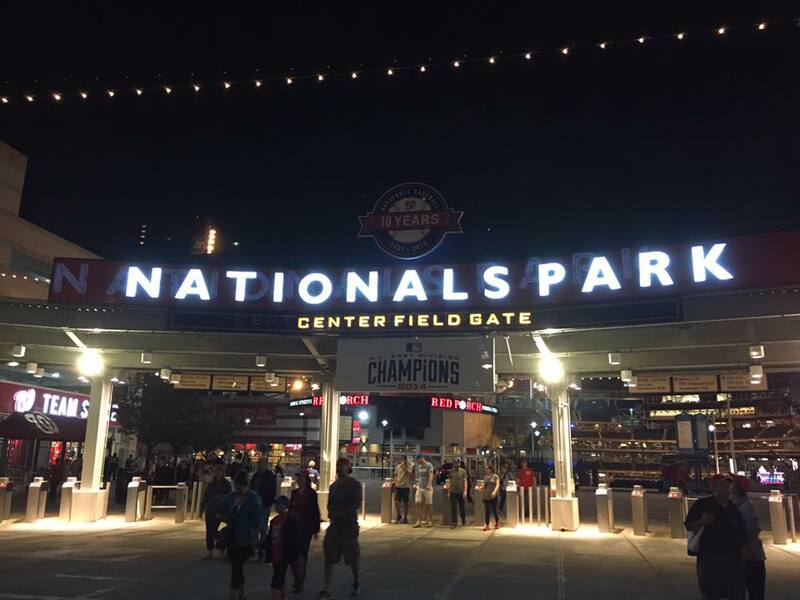 It was a fun night at the ballpark, and in the end, the lights went out on Nationals Park in a loss to the Rays. 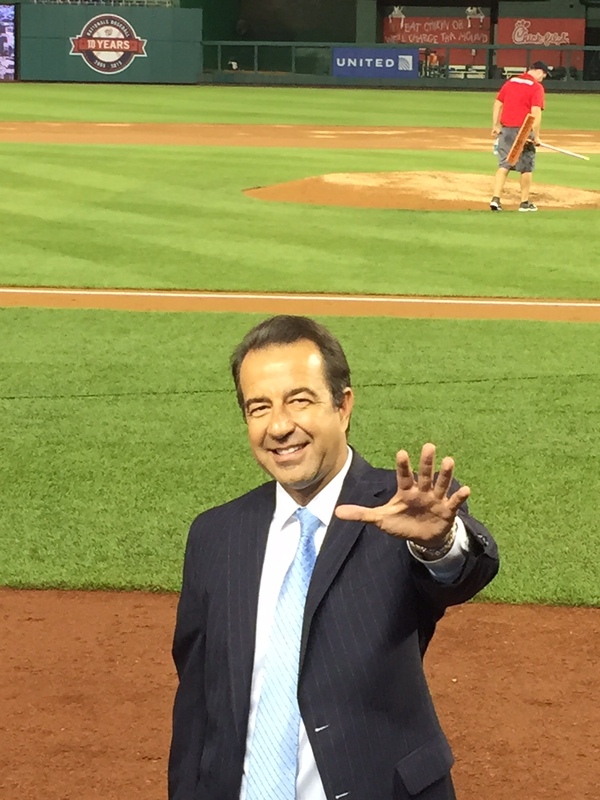 And Todd Kalas from the Rays goes home happy!